In partnership with the Waterford Civic Trust the unveiling of a Civic Trust Blue Plaque to the Waterford cockle women took place in Arundel lane on Friday March 8th 2019. It was the final event in the Women’s Centre weeklong programme celebrating International Women’s Day, which included the launch of a beautiful exhibition ‘Women at Work’ in Waterford City Library . This exhibition is the work of Ann Fitzgerald and Andy Kelly and includes the Passage East cockle women as a central part of this year’s photo exhibition. Also on exhibition are bonnets, made by women from the Centre through the ‘Bonnet Project’ which is funded by the WWETB. The bonnets are part of the larger ‘Roses from the Heart’ exhibition remembering Waterford women who were transported to Tasmania between 1788 & 1853. The Women’s Centre also hosted its annual women’s history walk honouring such great Waterford women as; Annie Brophy, Anna Manahan, Rosamond Jacob to name but a few. 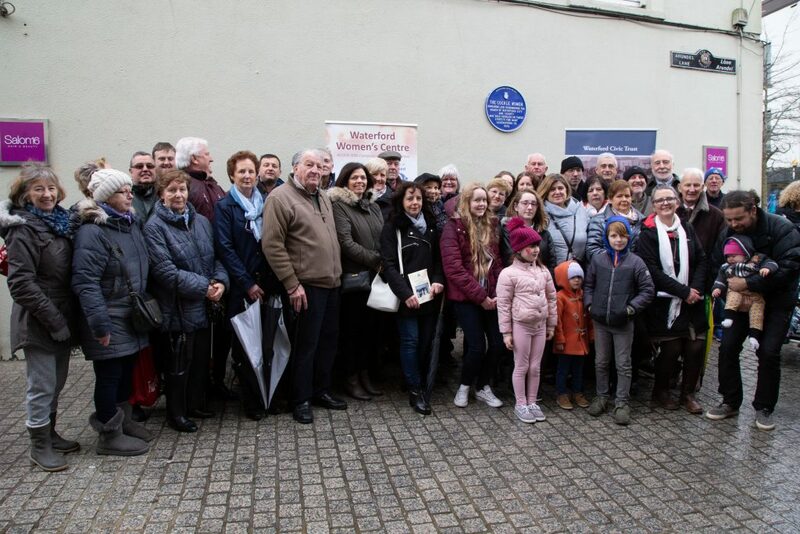 Despite the rain there was a great turn out for the unveiling of a Civic Trust Blue Plaque to the Waterford cockle women in Arundel lane on March 8th. Thanks to all who attended for making it such a special event, a very heartfelt speech from Breda Murphy whose granny Ellie Murphy and Aunt Molly Murphy were both cockle women. Maura Power nee Robinson granddaughter of Nana Ellen Robinson, Grainne Flanagan great granddaughter and Saoirse Flanagan great great granddaughter of Katty Dwyer, unveiled the blue plaque. A proud occasion for the families of these brave heroic women. The plaque was unveiled on the corner of Arundel Lane at the spot where Masher (Mary Cleere) Passage cockle woman, sold the cockles for 40 years up to the 1970s. Mashers grandsons James and John attended the event. Masher and Nana were two of the three well-known sisters, the third being Maggie Furlong, whose grandson, John and great grandson Sean were also present. Over 40 family members attended the event. Cllr. Jim Griffin picked, cooked and served delicious cockles cooked in the traditional way with milk with onions for the event which really added to the occasion. Great music played by Paddy Ryan and Jim Casey. They had everyone singing in the rain and gave a wonderful rendition of Cockles & Mussels in honour of the cockle women including Paddy’s Grandmother Janie Organ and his mother Stasia Ryan. Thanks to the Gingerman for serving the welcome tea and sandwiches. Thanks to Waterford City Council for supporting this event.